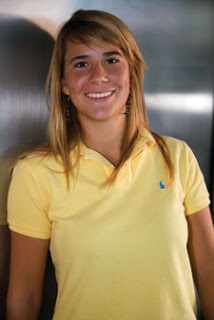 Azahara Munoz recently completed her senior season at Arizona State University, and later this summer will turn pro. But in-between, on Saturday, she won the British Ladies Amateur Championship. Munoz, from Spain, defeated her countrywoman and Arizona State teammate Carlota Ciganda in the final. But it's not Munoz's first big win. She was the 2008 NCAA individual champion. She also finished second in the U.S. Women's Amateur in 2008, and earlier this year played in the LPGA Kraft Nabisco Championship and made the cut. Munoz plans to turn pro following the U.S. Women's Open in a few weeks.